Last week, Samsung got on stage and showcased the capabilities of its newly-announced Infinity Flex display. The flexible screen can bend in the middle while working without image deterioration in unfurled state afterward, and do it hundreds of thousands of times. Expectations are that the tech giant will use it as a basis for its Galaxy F foldable phone that should launch alongside the Galaxy S10 series in Q1 2019. Although we only got a partial look at Samsung's prototype during last week's event, the tease was enough to inspire YouTuber Concept Creator. The result of this inspiration is a video that portrays the Galaxy F in a stunning fashion. The obvious highlight of the 3D concept render are the two displays. 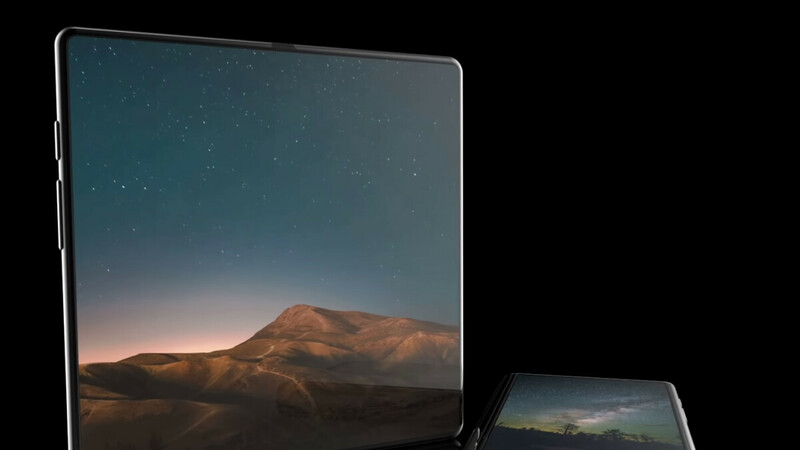 There's an outer screen with Samsung's signature Infinity Display design. This side also hosts the selfie camera. A flexible external hinge separates the front and back sides of the handset. On the back, we have a dual-camera composition. When this concept Galaxy F is unfolded and the large inner screen is shown, the device almost looks like the new iPad Pro but with even slimmer bezels. In case you're wondering, rumor has it that the two screens will respectively have 4.6-inch and 7.4-inch diagonals. While this render is based on the prototype shown at the Samsung Developer Conference event, the latest reports indicate that Sammie is still to take a final decision on the end design for the Galaxy F. The Korean giant is apparently deciding between five different models, which means that the foldable phone may end up being a side-opening affair or go top to bottom like an oldfashioned flip phone. Samsung is going produce at least 1 million units of its foldable phone during 2019. Sources indicate that the device retail for about $1,800, which will likely limit sales. For comparison, the 512GB Note 9, which is the company's most expensive model to date, sells for $1,250. Despite the hefty price tag, rumor has it that the first Galaxy F won't feature 5G connectivity. LG and Samsung are dinosaurs in the smartphone business and guiding the branch to degradation. I do not like Samsung Software, therefor i do not buy their phones. But one must give credit where credit is deserved. Samsung is the best hardware innovator out there, they made the phablets, they made the best screens on the market, they made the edge to edge screens, they build their own processors, they build everything, they even build Satellites, construction machines, war machines, and the list much much bigger, you can google "How big is Samsung"
By this time next year, Huawei, OnePlus and Others will all have their versions. Super exciting times! I've been thinking about getting the p20 pro but I can't find a definitive answer about its compatibility with boost, metro, or cricket networks. Do you know if it will work? They are Oled screens, when it's folded, the larger display shutsoff, therefor no battery drain, when it is unfolded, the small display shutsoff too. I have not worked out the geometry on paper yet, but dont understand why a 4.6" can't open to a 9+" ??? Seems like a lot of money for only 7". And why not a 6" that opens to 12" ??? Screen size is measured diagonally. That's why. I'm getting this device if it turns out to be the real deal. Looking forward to the true innovation from apple. iphone = Frankenstein phone. No Class, No real innovation. I mean my god can any of you just step back and appreciate the really good work that has potentially been done here. If true this is an innovative technology at the mainstream level. I understand its easy to nitpick and I am sure it's easy to find flaws, however, I don't think anyone in this thread has had any part in engineering such a potential masterpiece. I acknowledge this is a concept video, but I realize we are very close to a release date being announced. If ya don't like it go buy something else.